I haven’t always loved American potato salad. 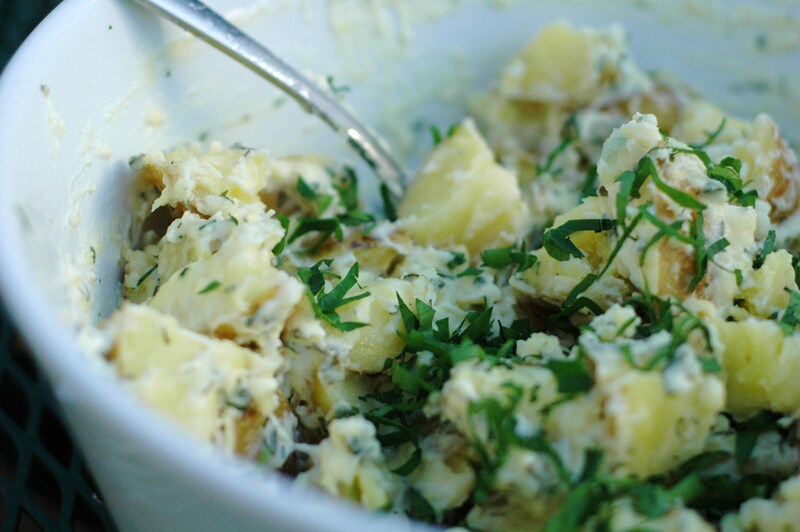 I grew up on German potato salad, and before you say, “Ew gross,” I’m not talking about the German potato salad you buy at the grocery store or they serve at restaurants some times. I’m talking about the kind my grandma made, which isn’t hot and does not have bacon in it. Because that is, indeed, gross. It’s made with a simple oil and vinegar dressing, some slivers of white onions, and that’s it. So good. So when I was first introduced to this whole American potato salad situation, you can imagine my reaction. I was just not a fan. There is something about your standard store-bought potato salad that makes me want to cry. It’s sweet and yellow-ish and mushy and I can’t usually stomach more than a few bites. But then, for whatever reason, at some point, I tried making it at home. And then I finally got just how delicious it can be. When it’s done right, it’s the perfect side for a bbq- refreshing, yet hearty and filling. I’m not going to lie and say that I prefer this version to my grandma’s… sacrilege!… but sometimes this is what hits the spot. This was one of those last-minute kitchen fiasco/experiments (sometimes you can’t tell the difference until it’s all said and done) right before people came over for a backyard bbq that has turned into my go-to for making potato salad. People rave about it, which only goes to prove my theory that if you put enough garlic in something, everyone will ask for the recipe. The loads of fresh herbs don’t hurt either, especially when you’re eating this on a hot summer day. 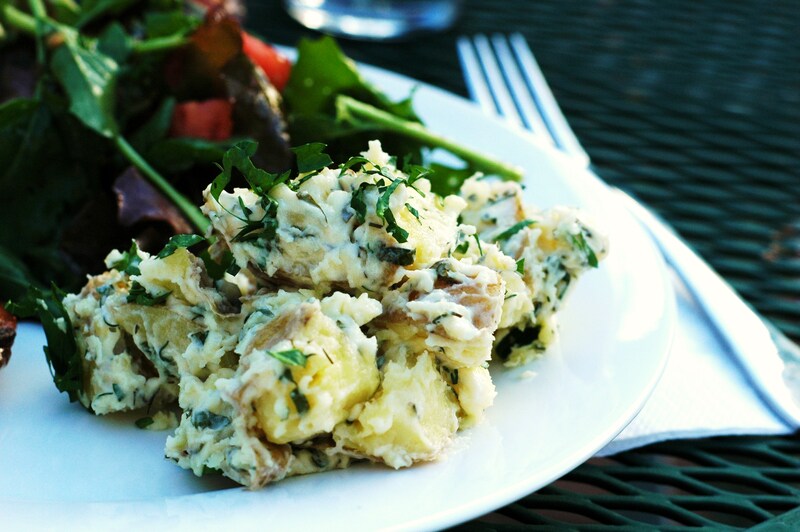 Somehow, they make calling this potato salad a little bit more justifiable. Listen, I know that it’s tempting when you’re having a bbq to just run into the store and grab a tub of the pre-made stuff, but this can be thrown together so quickly, and the results are so, so, so much better, that there’s hardly any reason not to make it. It’s great if you make it a day or two ahead, too; in fact, it only gets better. 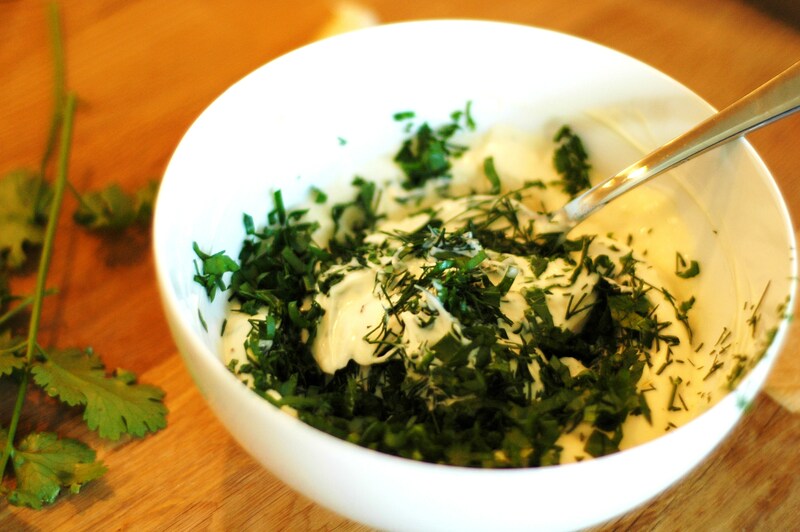 3 tablespoons chopped fresh herbs, such as dill, parsley, cilantro, scallion, chives, etc. Bring a large pot of salted water to a boil. Cook potatoes about 20 minutes or until tender (this amount of time will vary based on the size of your potatoes). While the potatoes are cooking, prepare the dressing. In a small bowl, combing the mayo, vinegar, and mustard. Chop the cloves of garlic very finely. Sprinkle the little pile of garlic with a big pinch of salt, and then use the back of your knife to mash the garlic against the cutting board to make a paste. The goal here is to not have any huge chunks of garlic left. Add the mashed garlic and the herbs to the dressing mixture and stir to combine. When potatoes are fully cooked, drain in a colander and then place in a large bowl. While they are still hot, pour the dressing over the potatoes and stir to coat all of the potatoes. 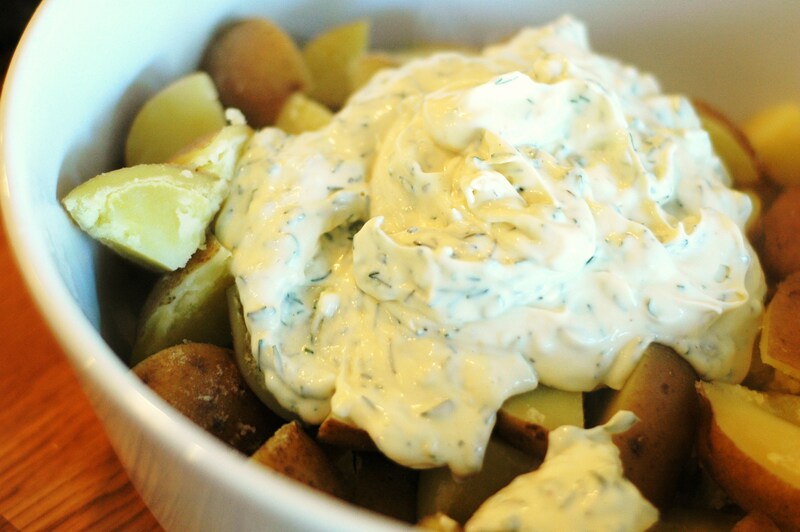 Cover the potato salad and place in the refrigerator until cooled. If you like, sprinkle with more chopped herbs before serving. Haha! NO! I don’t know what I dislike about it so much, maybe that it’s warm?! Touche about the bacon, though… it’s an anomaly.